I recently downloaded the image for core2-ros for raspberry pi and was able to successfully boot it, but cannot for the life of me find what is the password to actually log into the OS. Can someone please assist? I think this is probably not related to password. I was able to login via tty, but not from gui for some reason. Any thoughts? User and password (for the Core2-ros) was husarion /husarion. You just have to change log session. You can do it by clicking on Ubuntu’s icon and choose another session (password: husarion). It’s necessary to do it only once. We will fix that in the next release of image. I never was able to get the login to work, it just keeps saying “Failed to start session”. I pretty much did everything I could find on the net including using gnome, but it fails to login every time. 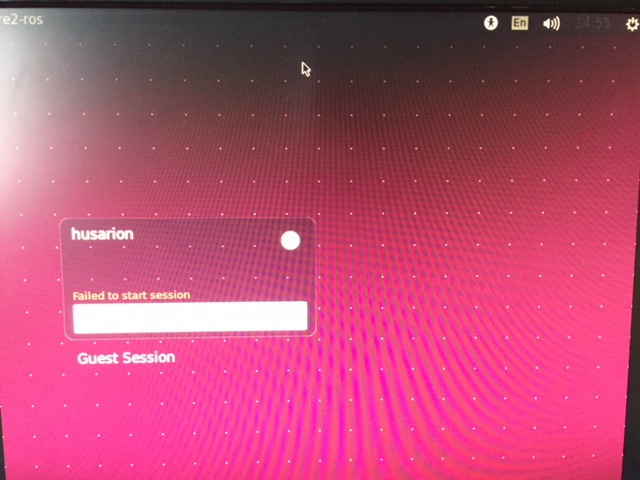 As for the solution above, not sure what you meant by clicking on ubuntu icon an choosing another sessionMoved on and just used the tty, but now I need to login remotely and I am unable to do so because of this. I am surprised no one else is having this issue. Is there a way I can just get the tty1 prompt without loading lightdm or any other gui? Log in to the husarion image via console. I don’t know what kind of desktop environment you have. I run Linux. If you run Linux, In a terminal window just ssh as husarion. If you run windows use putty to ssh in. If your sdcard is good then I would say your imaging software is failing. Do a google search for Etcher and use it to create your sdcard image. Thanks for the suggestions Jerry, I tried out Etcher and while it did not solve the issue I really like the tool and will use it in the future! If the image is working for others then it must be an issue on my end. I ordered another SD card from a different manufacturer to try and see if it will make a difference. As far as using ssh, I am able to connect and login, but using the ssh launched session is a bit unreliable with the remote desktop application I am using(NoMachine). I also have an inclination that this may be related to the video drivers for Tinkerboard not working properly. Will update on my progress next week. This should solve your problem without having to re-record SD cards. @Gerardas_Skeberdis may I know if you’ve turned on CORE2-ROS after my suggestions? Do you know that root password? Default root password is the same as normal (password: husarion).